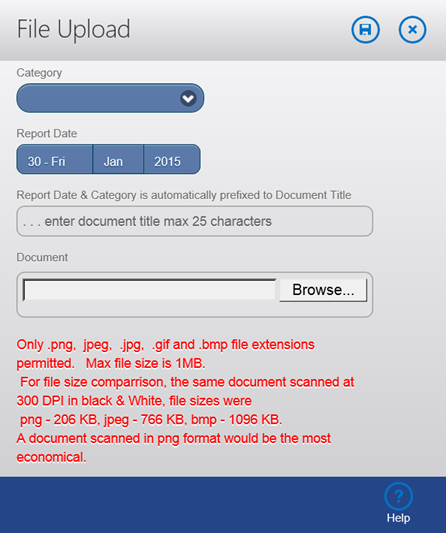 Upload of documents in Easy PMS Mobile is only for documents with. jpg, jpeg, png, gif, tiff or bmp filename extensions. Documents not in this format require be scanned into these formats. These documents are stored in the database as data, as distinct from links. By using the aforementioned formats, no additional software is required on viewing devices and file size and download time are significantly reduced. The maximum file size that can be uploaded is 1MB. Experience dictates quality and size is best achieved scanning at 300 DPI in Black & White in png file format.